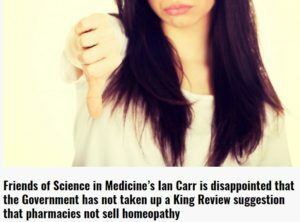 If you cannot argue against your critic, have him jailed (a chilling story from China): Alternative medicine types often find it convenient to use a narrative about how they are oppressed by the medical establishment. Perhaps this is because they are so willing to oppress points of view that they find inconvenient. Explainer: what’s new about the 2018 flu vaccines, and who should get one? What’s new this year? There are two notable changes. One change is that several states (Tasmania, Victoria, New South Wales, Queensland, Western Australia and the ACT) are now offering free vaccination for children less than five years of age. This is important because children are prone to severe illness and they spread the virus to their contacts, at home and in day care. Previously, only WA offered children the influenza vaccine free of charge. The second change is “enhanced” vaccines are available for adults over the age of 65. Two products have been developed to improve the immunity offered by the vaccine: one is a high-dose vaccine four times the strength of the standard vaccine and the second is an “adjuvanted” vaccine, that contains an additive that boosts the immune response to the vaccine. Nutritionists – I used to be a holistic nutritionist: It is shocking how little effort or knowledge it takes to become a nutritionist. The term is not protected, so all one needs is an inflated sense of their own importance, and they can call themselves a Nutritionist, start seeing patients, giving out bad advice, and pretending that they are some kind of expert. The Invention of Colonoscopy: A flexible video camera with the ability to sample and remove suspicious bowel lesions, colonoscopies can save lives and monitor disease progress. Crystal Healing: Stone-cold facts about gemstone treatments: Some people believe precious and semi-precious gemstones can be used for healing. This is based on the belief that the stones act as conduits of energy: healing energy in and disease energy out. So crystal healing is energy healing. The trouble is there is no basis for this mysterious energy. What is this healing energy? From whence does it flow and why is it attracted to rocks? Having arrived at the rock, why would it continue to flow into or out of your body? And what the heck is a chakra anyway? Perhaps this is a too literal-minded way to think of this New Age practice, but I can’t help it. Treatments need to have a basis, something explainable in terms of chemistry and physics. And crystal healing just doesn’t make the cut.